I thought it might be the perfect time to get this recipe posted. With Easter fast approaching, we will all soon find ourselves swimming in an abundance of hard-boiled eggs. 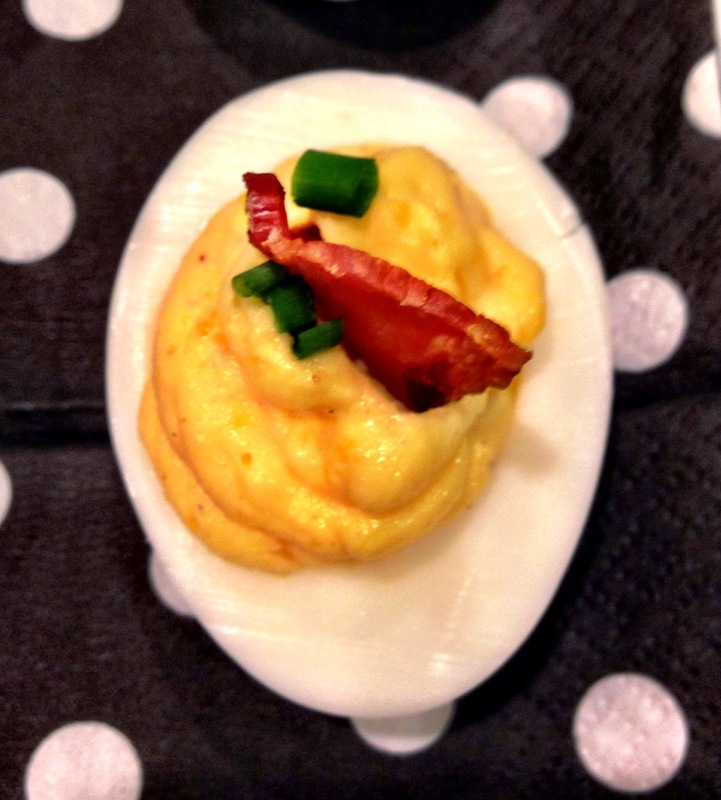 Here's a delicious solution: Make some deviled eggs! 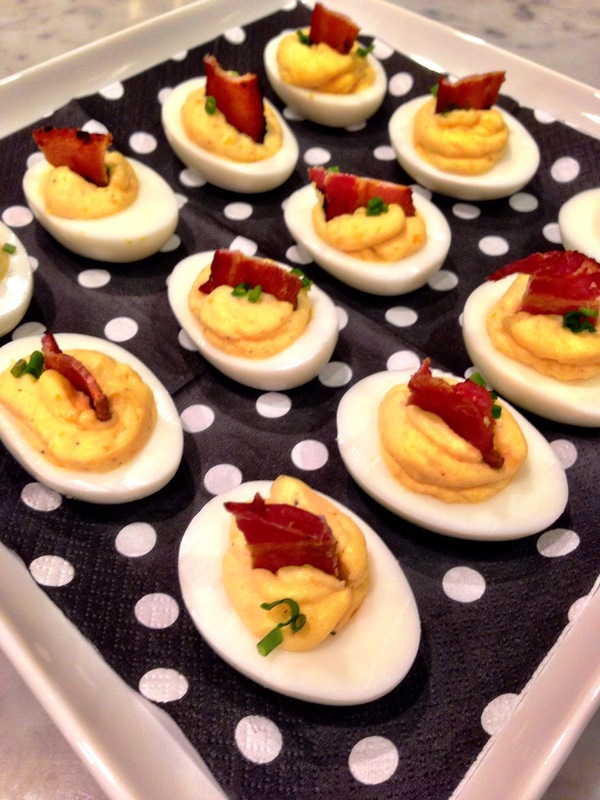 Deviled eggs remind me of my childhood. My step-mom, Diana, made the best deviled eggs. We used to enjoy them all the time. Then I recall a vast absence of deviled eggs from our gatherings. It seems they must have gone out of fashion (along with Lipton Onion Soup dip served beside Ruffles--so sad!). 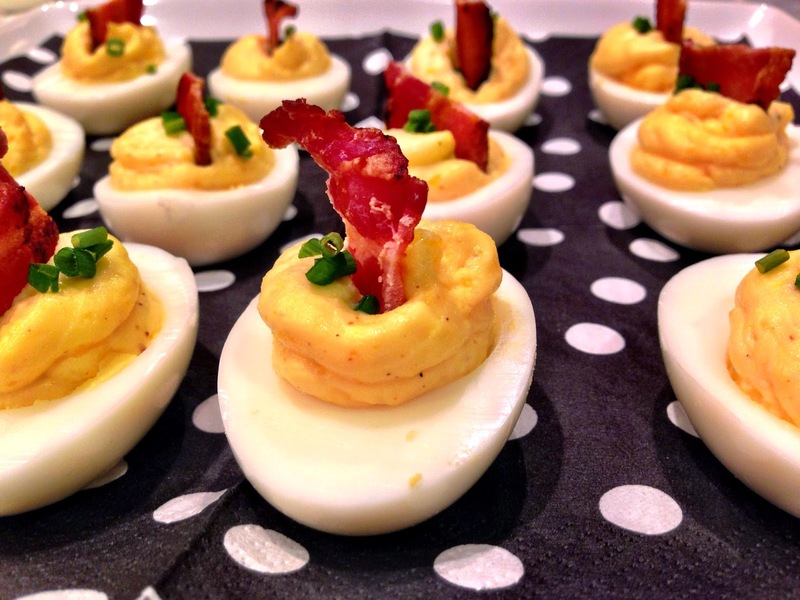 I'm sure I went at least a decade, maybe two, without enjoying deviled eggs. Thankfully, they're back en vogue (along with Ruffles + Onion Dip--at least at my house). There are lots of interesting variations to try. This one is simple and tasty. Cut the eggs in half, lengthwise and separate the yolks into a medium sized bowl, reserve the whites on a serving tray or plate. For the creamiest results, use a food processor to combine the yolks, mayo, butter, mustard, and seasonings. If you're not feeling super fussy, just use a fork to press and mix the yolks into a smoothish paste before adding the other ingredients and mixing well. Place the yolk mixture into a piping bag with a star tip. (You can easily use a gallon-sized plastic food bag, cutting off the bottom corner tip.) Pipe the filling into the egg whites. Garnish with fresh chives and a crispy piece of bacon. I'd take these over Cadbury any day! What's your favorite variation?